I must confess something… my obsession with these sweet potatoes has little to do with the flavor and far more to do with the appearance. 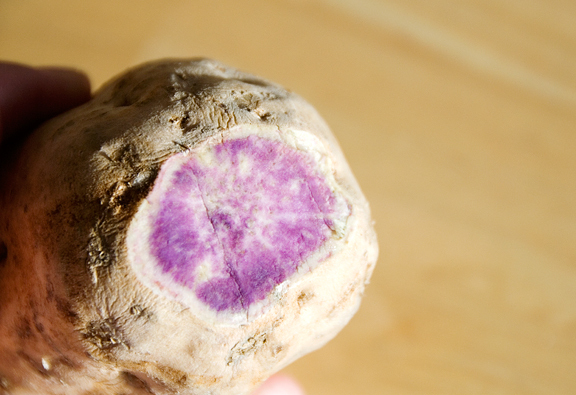 You see, these unassuming tubers are purple on the inside. Have a looksee. I had to try it out for myself. It’s part of my redemption for not being able to read Chinese. My mom’s reaction was, “Haven’t you ever had that before?” And this is why I choose to document everything – because between my mom and Grandma, there are a gazillion recipes and foods that I don’t know about. I’m not sure if it’s generational or not, but they always seem surprised that 1) I just discovered something they grew up eating and 2) I didn’t know it existed beforehand. Honestly, their reaction is a combination of amusement and disbelief at my lifelong ignorance. Mom said I could boil or steam the potatoes. Grandma prepared them steamed with these lovely Chinese ribs on top. My web research came up with sweet potato pie (a purple pie!) and tempura sweet potato (purple tempura!) and mashed sweet potatoes (purple mashed sweet potatoes!) and sweet potato gratin (purple sweet potato gratin!) and… you get the point. Since I only dared to buy two for fear of screwing up a recipe and wasting food, I thought I’d just peel, boil, slice, and try them straight. The water turned blue. 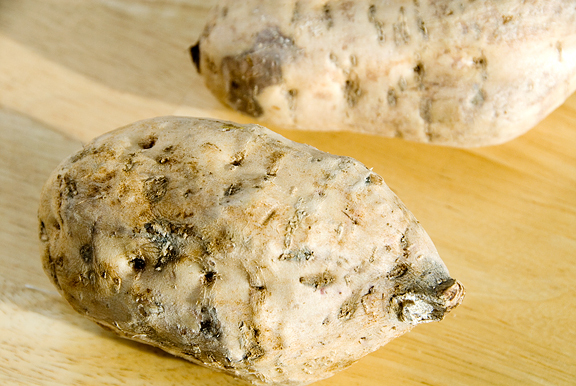 These sweet potatoes are good for you. I read they are full of vitamins A, B6, and C. They taste like… sweet potatoes, but they are purple! Haven’t come across these yet but I’ve been reading about them on a couple of other blogs too. They’re so cool! Purple.. I love purple and they seem to get a stronger colour when you cook them which isn’t always the case with purple food. Never seen them in the UK though I will keep and eye for them now, wonder if we can grow them here? I have never seen these before, but they are so pretty! I have a hard time finding anything out of the ordinary around here, but I’m gonna keep my eyes open because these look like so much fun! They’re delicious! We barbeque them every summer. Just boil them a little, then wrap them in foil and stick them on the grill. Awesome. Those purple potatoes look great! The white dots almost look like stars in a night sky. I love to have them ~ half boiled, wrapped in aluminium foil & ‘thrown’ into the BBQ charcoals :) Just like what Rachel mentioned. http://www.terrachips.com/products/Terra-Blue-Potato-Chips.php These are my favourite chips,too! I miss those sweet potatoes SO much! I can’t get them here in Florida. I do think they have more flavor than regular sweet potatoes though. I usually just microwave them, peel the skin off and eat them. SOOOOOO delicious. 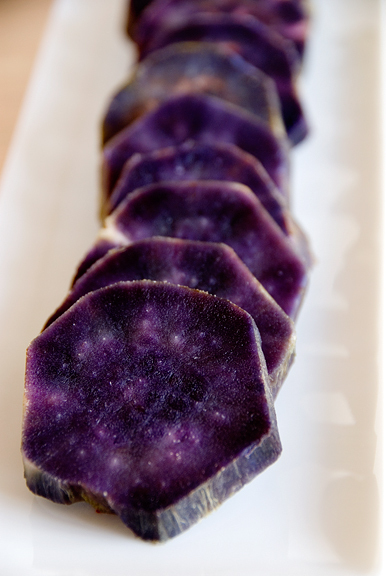 Wendy – I’m sure if purple potatoes were the norm, I wouldn’t be so excited, but I love the color and it’s so unusual! Esther – I read that they grow in Hawai’i. So perhaps not the best climate in the UK? Deborah – I know what you mean about difficulty finding out of the ordinary. These potatoes are over a 1 hour drive from my house. Rachel – Oooh, I’ll give that a try next time! Danny – yep, if you google okinawan sweet potato, you might find a picture of a slice of pie. It’s very cool (lavender in color). Amy – Cool huh? I love naturally purple food ;) thanks! Kevin – They are really pretty when cooked. Nice analogy, my resident astronomer will dig that. 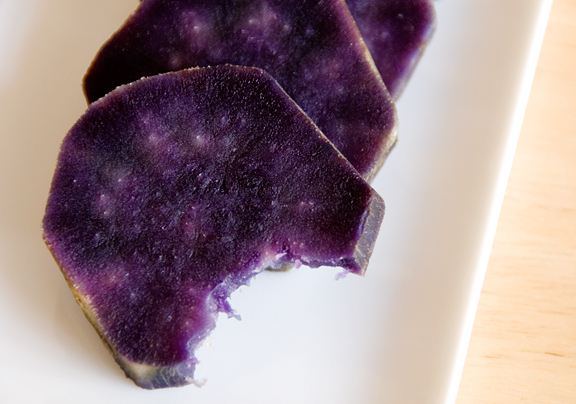 Ma-li – oh wow, are they blue potatoes or the okinawan sweet potato? Valerie – I have heard that some folks have successfully ordered a box from Hawai’i – sometimes joint with a supermarket interested in carrying more exotic produce. Wow! They’re really stunning! I’ve seen them before, but I don’t think I’ve ever seen them even more purple than before they were cooked. They look great! Hi Joyce :) – ice cream?!? I will have to think about making that. Sounds really good. I really like the flavor, it’s subtle to me. Glad you guys are settled in now. Julie – I’ve seen purple potatoes, but I had never seen these (which aren’t purple on the outside). They get nice and deep purple when cooked, neato!! I’ve seen a couple of varieties of purple potato, the sweet potato (I had no idea of its use in asian food, it’s sold as mashing sweet potato here), and another variety called a congo potato. It’s small, and uncooked and peeled it has a very darkish purple colour. When cooked it retains it’s colour. Next time I see them I plan to serve salmon steaks on a bed of mashed congo potatoes, for the flavour and colour. I know this was posted awhile ago but I just found your site today. I actually live in Okinawa and they use those sweet potatoes for absolutely EVERYTHING here! Mostly dessert but the Okinawans are totally obsessed with it. Its pretty cool. BA – good on ya. Tara – how cool! I’m tempted to try making a dessert with it, but I don’t get out to buy them too often.